I thought I would never find one but recently this fellow appeared on the bay and I won the auction. As you can see, it has not been well cared for but here he is, the 1929 Bulova Watertite Watch. I added the bracelet to photograph it. I cannot open the back so I do not have movement photos or information from the marking. It is not running and the stem will not move. I will be sending this one on summer holiday to the workshop of M Cousineau to see if he can coax open the back or, if I'm lucky make it run again. It appears as if there is some sort of additional bezel ring alongside the dial perhaps to aide in making it 'Watertite', hopefully I can get some more photos in the future. Truly a rare Bulova watch if ever there was one. Outstanding!! That's a great find. Sure looks like it's had a rough life. I'm really looking forward to seeing what can be done to bring him back to life. My money is on it having either a 10AN or 9AN movement. Those two back holes have me intrigued. 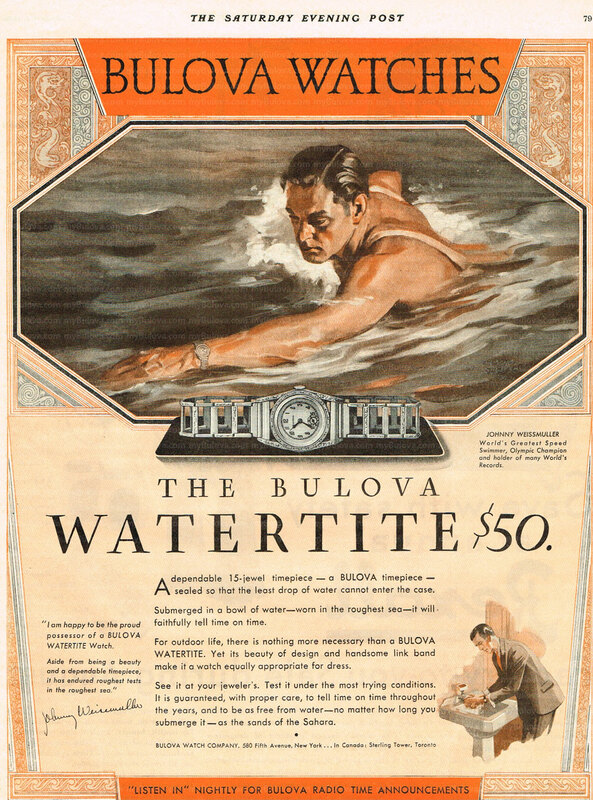 1930 Bulova Watertite it is. Unbelievable. Lucky you. Lucky us on myBulova. The real Watertite!!!! And like you guys, I am soooooo curious what is inside! This Watertite is one of my favorite models; congratulations Geoff on finding this one. Some of the Watertite models to come later were top loaders that had a bezel ring and a split-stem; any signs the bezel ring would separate on this one? I don't think so Ken. All indications are that the back is screwed on. The stem must be split as the crown does sit on that funny looking tube. The crown doesn't turn or pull out with light pressure and I don't want to force it. I'm trying to imagine what someone could have done to create those deep scratches in the back. I can't help but wonder if the screw heads were somehow chipped or pried off. Excellent find Geoff, it's a beauty even in it's present condition and well worth restoring. Congrats! My guess would be that the 2 indentations have tapered set screws in them that have had the slots twisted out; and somewhere along the line someone thought the indentations were to insert a case wrench and twist it off. That would explain the deep scratches; as it appears the worst damage is on the "counterclockwise" sides of the indentations. There could be a second threaded back under the outer caseback that it is screwed to; to make it watertite. I have a slightly newer Lamont (another Swiss) that has set screws next to all 4 lugs to cinch down the waterproof back...and all 4 set screws are toast. I researched waterproof watch case evolution/history a few years ago, and I think if you are patient and google the right combination of words, you can probably find the patent info on the case with drawings that will indicate how it's put together. PS - Lke your band choice, it's pretty close to orig in appearance. Wow... the holy grail. Seriously I have been looking for this watch forever. Great find Baker! He's been beat up and left in the ditch, but he's still around. Such a cool find. OK, Dr Counsieau (timemachines) has opened the subject watch and sent me these photos, they answer a few questions we've had. There are no markings on the inside of the case back, it screws down, so the holes on the outside are for the wrench to grip, not for screws as I had originally opined. The movement seems to be a generic 15 jewel 4 adjustment 9AT Bulova. Service marks appear to be 1930'2 and 1940's vintage.